After thirty years of attending and participating in InfoComm (and its various iterations), it would be easy to become blasé about new products on display at the event. And add to that, a change in “product rollout” dynamics in the AV industry in general. Historically, companies waited till the annual show to roll out their latest and greatest, creating a lot of anticipation and excitement for a big trade show. Today, product introductions take place all the time (once they are ready to see the light of day). While this may take some of the luster off of the big introductions, at the recent InfoComm show, it did not take much digging to find a plethora of intriguing products– and even some revolutionary ones. This was not your typical InfoComm of recent years. There was just so much more in terms of product evolution. And now that the dust has settled from the show, it’s a good time to reflect with a few weeks of distance and objectivity. As usual, the big display guys dominated the exhibits as you entered the show. In every display booth both large and small, there were continuing developments in flat panel displays featuring larger sizes, ultra-thin bezels, higher brightness outdoor models, and 4K taking center stage. We also saw OLED finally coming to fruition in creative and expanding ways. Here is just a small portion of what caught our eye (with apologies to those not mentioned– no one article can mention all the new things shown at InfoComm. The 800-pound gorilla in the room, so to speak, at InfoComm in Las Vegas, was direct view LED. Fine pixel pitch was all over the show floor, but just when you thought you knew about LED technology, Sony takes it one step further showing that where we are at today is really just the beginning of possibilities. On display was their 32’x9’ Sony Canvas wall with a resolution of 8Kx2K. It is composed of Sony’s CLEDIS (Crystal LED Integrated Structure) technology. The pixel pitch is stated as 1.2mm (but not emphasized by Sony) but that is not the story here. On a conventional 1.2mm-pitch LED video wall module, the RGB LED device will take up 50-70% of the pixel area. With Canvas, the emitting area is only 1% of the pixel area meaning 99% of the module is black (! ), making for really high contrast, especially in high ambient light environments. It flies in the face of conventional wisdom, and by the audience reaction was a hit at the show. This is just the beginning of direct view LED, not only in the technologies themselves but in the number of manufacturers who will supply them. All the big display companies like Samsung, NEC, Christie, Barco, Planar, and Panasonic among others like Silicon Core, are jumping on the bandwagon. We also see companies like Daktronics, Watchfire, and ADTI Media who serve the signage industry, entering the fray. There were also approximately twenty other less well0known vendors out of China at the show… and if you do not know them now, you very well might in the near future. What will be interesting to see is that with the evolution in direct view LED and the plethora of suppliers, both national and international, who will the market migrate to? At first glance the more well-known national brands have the brand advantage but since the majority of manufacturing comes out of plants in China, and as prices come down, will the market coalesce around a few, or fragment? Only time will tell. 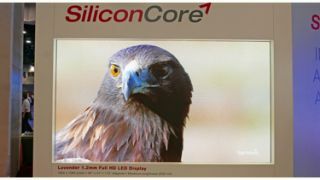 Silicon Core, one of many direct view LED suppliers. What we do know is that direct view LED will impact the large area display world of video walls and even projection. If you do not believe that direct view LED is for real, then go to the Westgate Hotel and their sports book to see the largest display of its type in the world. At 220 feet long and 19 feet high, comprised of 1,640 2.5mm Christie Velvet LED tiles boasting over 65 million pixels in a sweeping format, HB Communications, Christie, and RPV showed just how good this technology can be, and it is here and now. Turning our attention to what is becoming the mainstream of the display industry, let’s look at a few examples of LCD and OLED flat panel advances. As noted before, we are seeing 4K become more pervasive as prices decline– and the expectations of what high dynamic range (HDR) promises as it migrates into the commercial realm. Displays are getting thinner and lighter and more and more commercial displays are good to go for 24/7 duty cycles. We are seeing System on a Chip (SoC) pioneered by Samsung as well as modular systems from various manufacturers, providing all in one solutions of display and PC. We are also seeing many LCD manufacturers coming out with their own proprietary white board and interactive packages. Let’s take a look at a few advances that caught our eye, pun intended. Samsung showcased several new developments in their LCD lineup. Their new P series is being released under Samsung SMART Signage Platform 4.0. For the first time, this platform will be powered by Samsung Tizen instead of Linux. This will provide digital signage with improved speed, faster response time, and improved graphical appearance. Under the banner of smaller (or at least thinner) is better, Samsung introduced their UH55F-E Extreme Narrow Bezel LCD Video Wall display at 1.7mm bezel-to-bezel getting ever closer to the holy grail of a seamless image in LCD flat panels. When size matters, the folks at Sharp showed off their 120” Class 4K Ultra HD LCD display. Also breaking the 4K barrier of resolution, they showed their 85” Class 8K Ultra HD 120Hz LCD display using IGZO technology. As a side note, for the technologists among us, it is the development of manufacturing and imaging enhancing technologies like IGZO and Quantum Dot that has extended the life of traditional LCD technologies. NEC should be mentioned, not specifically in ground breaking new flat panel technologies (although their videowall panels looked great), but in the areas of unique applications of content, going beyond the confines of a 16x9 aspect ratio display. They mixed up sizes and shapes as well as projection and flat panels to illustrate what can be done with a little creative thinking. There is no question that OLED is on the rise. Samsung was there with their Transparent OLED Displays as was Planar with their LookThru transparent display. NEC joined the adopters with their new 55” OLED prototype. These were among others showing variations of OLED in their booths but it was LG who decided to take it to the next level and focused significant attention and booth space on various versions of their super thin OLED technology. Their lineup includes a 55” Dual-View Flat OLED Display with mirrored Full HD content on either side and a 65-inch Dual-View Curved Tiling OLED Display that can be linked together to form an attention grabbing curved display. They also showed a 55” Single-View Arched OLED Display that can be custom bent to concave and/or convex formations for constructing immersive tunnel-like environments that engage and enthrall customers. Of course they did not forget about LCD and for unique placement applications, they showed their 86-Inch Ultra Stretch IPS Display is ideal for digital signage with a unique 58:9 aspect ratio. We have been teaching about OLED as a “future technology” since 1999 and by most accounts it has formally arrived. While flat panels of all types have ascended in popularity over the last few years, projectors are still the display of choice for screens over 100” diagonal. To cover the whole story of projectors at the show would necessitate speaking about things like advanced edge blending, image mapping from the biggies like Christie, DPI, Barco, and Panasonic as well as the 4K single chip DLP from Texas Instruments, not to mention the zero-loss zoom lenses from Canon, but the big story at the show was solid state illumination. If there are doubts that this was and is the big story, just ask yourself in no particular order what do Casio, NEC, Christie, Canon, DPI, Barco, BenQ, Panasonic, Optoma, Ricoh, Sony, Vivitek, Epson, Hitachi, Viewsonic, and Eiki all have in common? Give yourself a gold star if you guessed solid state illumination. Ultimately it all boils down to how we handle light and we are definitely in the phase of majority adoption of solid state. It began with LEDs taking the place of traditional lamps and then has evolved to LED+Laser, Laser+ Phosphor, and then full RGB Laser. There are all kinds of benefits starting with 20,000-hour duty cycles with lower TCO not to mention expanded color space/gamut but most recently we are seeing an a more diverse group of models and an expansion of light output. Not having the space to cover them all, here are a few developments worthy of recognition. Casio has been in the laser/LED hybrid business for a long time and was the first manufacturer to bring laser technology to the projector market in an affordable package. Casio was highlighting their latest laser/LED hybrid model, the XJ-F210WN, a 3500 lumen, 1280x800 transportable conference room model which was released this spring. At a MAP of $1049, did we mention affordable? Digital Projection International (DPI) showed their new E-Vision Laser 6500 at 1920x1200 resolution putting out 6500 lumens and their E-Vision Laser 7500 rated at 7,500 lumens. This model offers geometry correction, edge blending, Lens Memory presets, and DICOM simulation. It can also be paired with DPI's new ultra-short throw (UST) lens (0.38.1). This combo will produce an image width from as little as 6.9' and up to about 24'. Stepping up in light output to 8,000 lumens there is a lot out there now to choose from. Canon, NEC, BenQ, Hitachi, and Eiki all brought out their new single chip DLP models at 8,000 lumens and 1920x120 resolution. Canon was putting on a great show with its new LX-MU800Z laser-phosphor driven projector and NEC was showing the PX803UL, released earlier this year. BenQ joined the 8K lumen group and showed their new LU9715 BlueCore laser light source projector. Hitachi debuted their new entry called the LP-WU9750B. Eiki also used InfoComm to expand its product line with the new EK-810U. By the way, most of the projectors in this class give us 24/7 operation and the ability of 360 degree mounting rotation expanding our placement options. It is no surprise that Christie was there in force and I might add that their trade show booth won the hearts and minds of all those who entered their virtual hockey area. If you missed it just Google it and see what I mean. Among their new releases at this show is the D13WU-HS, a 12,000 lumen 1920x1200 single-chip DLP projector. They also have the widest selection of solid state options, currently offering six 1920x1080 laser-phosphor based 1chip DLP projectors ranging from 5,000 lumens to 7500 lumens. The team at Epson proved that high brightness solid state illumination (laser phosphor) was not the bastion of DLP alone. The Epson Pro L25000U looked incredible and produced 25,000 lumens and uses inorganic native 1920x1200 3LCD chips. For all the 4K fans out there, Barco showed off their new F90-4K13. This unit delivers 3860x2400 resolution using TI's new 4K single-chip DLP imaging device that I noted earlier and a laser phosphor light source that will run up to 40,000-hour life span. The F90 is rated at 11,800 "center lumens" and is designed for heavy duty 24/7 operation and it is available with Barco's new ultra-short throw lens just released at this show. Keeping with the 4K theme, Sony featured two new SXRD-based 4K laser projectors-- the VPL-GTZ270 and VPL-GTZ280. Both are native 4K (4096x2160) and use laser to produce up to 5000 lumens with a life up to 40,000 hours. The GTZ270 is intended for use in planetariums, theme parks and museums, while the GTZ280 with infrared light output for night vision is designed for visualization, simulation and training applications. Optoma was showing a prototype of their new single-chip DLP 4K laser phosphor projector. This unit offers not only 4K and laser, but a 0.18:1 ultra-short throw capability that puts a 100-inch image on a wall from just two inches away. Rated at 3,300 lumens, production units will be out in Q1 2017.I left Panasonic for last for a reason and that was taking resolution of a projector to the next level. Yes, they displayed a trio of DLP 1920x1200 laser-based installation models with the PT-RZ570U at 5200 lumens, the PT-RZ970U at 10,000 lumens, and the big daddy PT-RZ31KU putting out a blistering 30,000 lumens… but what caught my eye was a prototype of the PT-RQ32KU. This was the highest resolution projector at the show. They call it 4K+, and it has a native resolution of 5120x3200, or double the pixels of native 4K and puts out 26,000 lumens. Put January 2017 on your calendars for the release. Truth be told, there is just no way to relate the entire InfoComm experience in an article. As in all such reviews, all writers are certain to miss something. But one thing is for sure, and that is our tools (AKA technologies) to do our jobs are growing exponentially. Back in the day we had the technology providers come to us. Now we can go to them virtually online, or at a show like InfoComm. I will have reached my objectives if I motivated you to look deeper into what is on the horizon. Alan Brawn (alan@BrawnConsulting.com) is a principal of Brawn Consulting LLC an audio visual and IT consulting, educational development, and market intelligence firm with national exposure to major manufacturers, distributors, and integrators in the industry. He was formerly President of Telanetix and previously National Business Development and Product Marketing Director, Samsung Electronics. Brawn received the Fred Dixon Lifetime Achievement in AV Education from InfoComm in 2015.